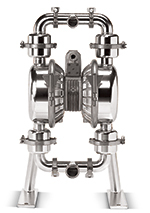 IWAKI Nordic A/S offers FDA-certified pumps from amongst other the market leading American manufacturer Standard Pump. These pumps are drum pumps (centrifugal and progressive cavity pumps) and also air-operated-double-diaphragm pumps (AODD). Further, we offer plastic tanks and technical solutions in FDA and EU 10/2011 approved plastic materials for the pharmaceutical and food industries. The drum pumps manage viscosities up to 100,000 mPa•s while the air-operated-diaphragm pumps handle particle sizes up to 15.9mm. 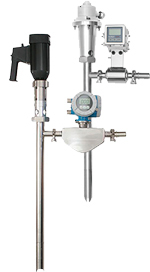 The pumps are suitable for both food, pharmaceutical ingredients and cosmetic products. For control use our batch control systems. The centrifugal drum pumps are suitable for dairy products, juices, beer, wine, concentrates and fragrances for cosmetic products. 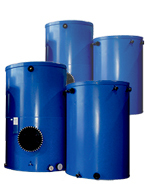 The pumps are available in different lengths for different containers including drums and pallet tanks. The drum pumps are portable and easy to clean. The progressive cavity pumps are designed to pump viscous foods, pharmaceutical ingredients and cosmetic lotions from various containers including drums and pallet tanks. The pumps provide optimal product transport in a continuous, smooth and gently flow. The pumps are also easy to clean. 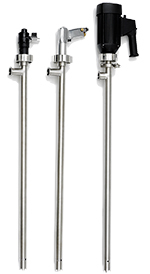 Our sanitary AODD pumps are an ideal solution for transport tasks in food processing and pharmaceutical applications. 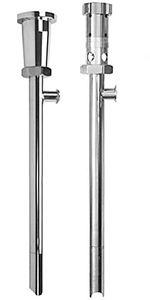 The pumps are manufactured in highly polished SS316. These pumps are available in 1½ “and 2” models. The pumps can be delivered with either PTFE or santoprene diaphragms. The sanitary batch control systems are designed for dosing and filling tasks from various containers including drums and pallet tanks. The range offers “Ultra Mass BCS device” for preset dosing of primarily “nonconductive” media and alternatively a “Full Bore Magmeter” for flow and volume control of conductive media. The batch control systems are placed on the outlet pipe and are easy to use. We offer tanks and technical solutions in FDA and EU 10/2011 approved plastic materials for the pharmaceutical industry and the food industry.